Four standard actuator sizes are available upon request: Mini (designator “A1”), Small (designator “A2”) and 180° actuator (designator “A2T”), Medium (designator “A3”), and Large (designator “A4”). 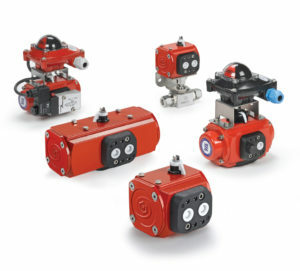 Improved operational speed enables better valve opening and closing control. ATEX certification of Valves-Actuators assemblies isavailable on request at the time of order quotation.